Fiat has just launched a new device that could change the way motorists drive their cars forever. The Managing Director of Fiat Automobiles, Lorenzo Sistino, presented eco:Drive to the international press last week at the 2008 Paris Motor Show. This innovative system gives drivers an accurate insight into how their driving style influences their fuel consumption, and actively helps them to drive more efficiently, saving money and reducing their CO2 emissions. 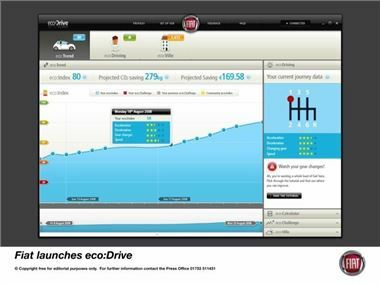 eco:Drive is a free software application that can be downloaded and installed on your computer. It is available now at www.fiat.com/ecodrive (where you will also find a video with more information about eco:Drive). eco:Drive works using Fiat’s acclaimed Blue&Me entertainment and communications system. Plugging any USB key into the Blue&Me port allows eco:Drive to record detailed information about the vehicle’s efficiency and your driving style during a journey. The information can be ‘read’ by plugging the USB key into your computer when you’ve finished driving. Users can analyse fuel consumption and emissions for each journey made, and receive advice on how to drive more efficiently, reducing their impact on the environment. eco:Drive will give you a score out of 100 - your eco:Index - to show how efficiently you have driven, based on your acceleration, deceleration, gear changes and speed. A series of tutorials will help you to improve your score, showing you how to perfect your driving using detailed information from your own journeys. Drivers who start eco:Driving can expect to improve their driving efficiency by up to 15 per cent. That means a 15 per cent reduction in CO2 emissions and in fuel costs. Fiat has also created ecoVille, a unique online community populated by all eco:Drivers from around the world. Users will be able to share tips, watch the community grow, and see just how much CO2 they are all saving together. Fiat 500 and Grande Punto are the first Fiat Group vehicles to use eco:Drive, and the system is available to download and install now, free of charge. In 2009, eco:Drive will be extended to the rest of the Fiat range equipped with Blue&Me. eco:Drive will be open to feedback from users, which will help Fiat to update the application and make it even more useful in future. ecoDrive is an evolution of the Blue&Me platform, developed by Fiat Group Automobiles in conjunction with Microsoft, that has already earned considerable recognition. Over 500,000 systems have been installed in the Group’s models over the last two years. Since Honest John has a FIAT 500 he has downloaded the software and is putting this on trial from 9-10-2008.